10 Glass Kitchen Cabinets Ideas, Make Your Kitchen "Fragile"
FeastHome – Even though a glass material is fragile, there are many people use this material for their kitchen cabinets. It is because glass is able to create an elegant and fancy look to the kitchen area. 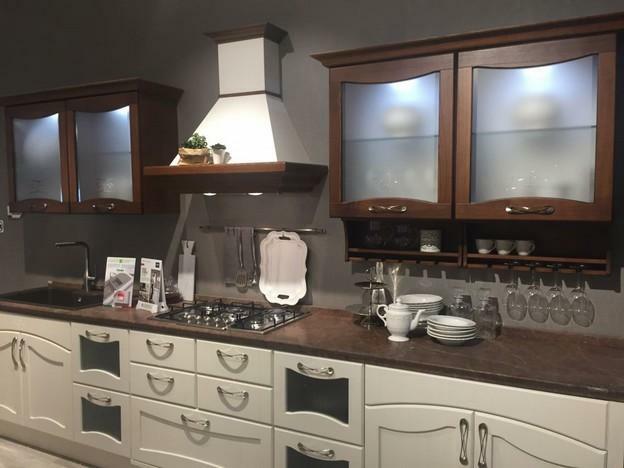 Moreover, if a kitchen cabinet uses a glass as the material, the cabinet can display the attractive tableware so that it can also be a decoration for the kitchen. There are also various types of glass that are able to be used for a kitchen cabinet. So that you can choose one which is suitable for your style. Clear glass is the most used type of glass material for a kitchen cabinet. This kind of glass is able to show your collection of tableware. Just like the picture above, the cover and rack of the kitchen cabinets are all using the glass material. 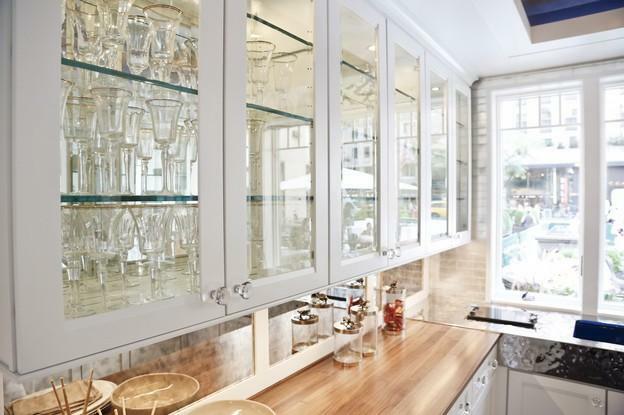 The white frames are chosen in order to make the glass kitchen cabinets look simple and elegant at the same time. Moreover, the glass kitchen cabinets above blend very well with the wooden countertop. 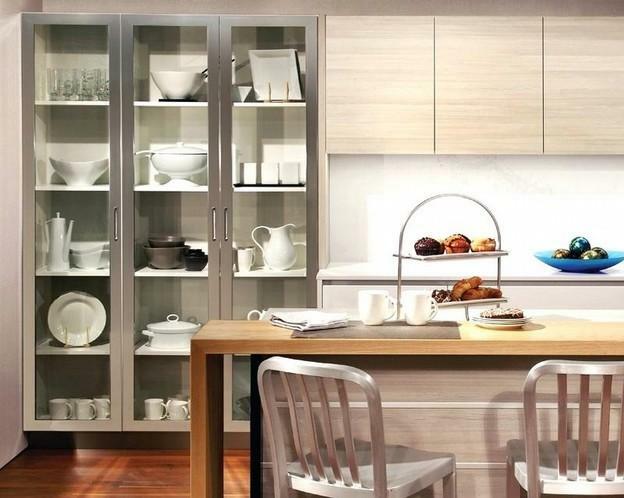 24spaces.comA kitchen cabinet which is made from a blurred glass material is suitable for you who want a private storage for your kitchen utensils and tableware. You can follow this idea of a glass kitchen cabinet. The kitchen cabinets use a pulled door that makes it looks anti-mainstream. The frame that is made from a stainless steel material blends perfectly with the white tile kitchen walls. A rack is installed at the bottom of it in order to add more storages. www.foodindependenceday.orgFor you who want an attractive glass kitchen cabinet, you can have a striped glass kitchen cabinet just like the image above. This type of glass kitchen cabinet is also able to create a private storage for your tableware and kitchen tools. Moreover, it is able to bring a modern elegant touch to the kitchen area. 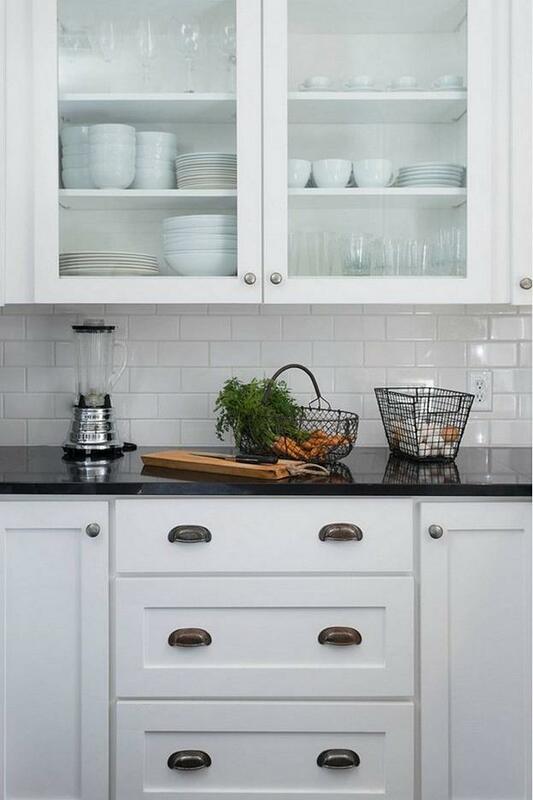 Look at the handle of the kitchen cabinets, it is very simple yet elegant. www.zacharyhorne.comThis kitchen has a rural and traditional look because of the wood material used for the kitchen cabinets frames. It is a great idea if you want to use a glass material for your kitchen cabinet without any elegant style involved. The householders add lights inside the blurred glass kitchen cabinets so that they will not look dark. The wooden frame of the cabinets blends really well with the brown marble countertop. The racks are added at the bottom of a blurred kitchen cabinet in order to have more storages. www.bajawebfest.comThis kitchen area looks modern and minimalist because of the blurred glass material kitchen cabinets that match perfectly with the wooden ones. 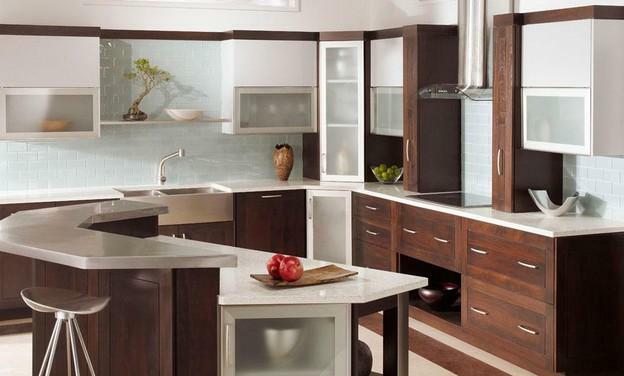 The wooden kitchen cabinets bring a warm and natural style to the area instead of ruining the modern minimalist look. The householders use various different sizes of glass kitchen cabinets according to the number of tableware and kitchen utensils they have. It is also a great idea to make the area looks less boring. White frame for the glass kitchen cabinets is chosen in order to match in with the stainless steel sink and dining table. www.aluminumsys.comA small glass kitchen cabinet is suitable for you who do not have much tableware and kitchen tools to be stored. 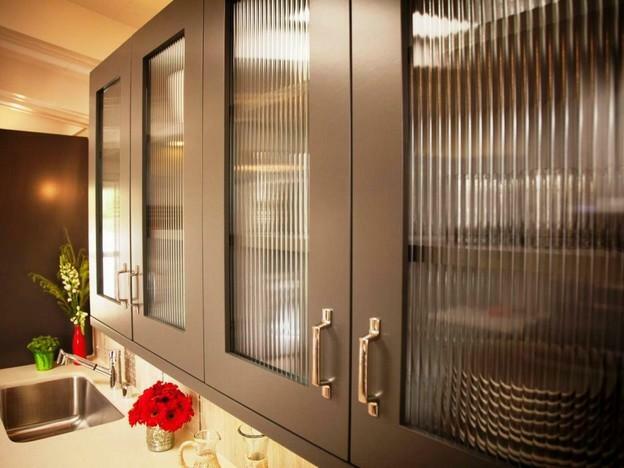 This kind of glass kitchen cabinet is also a great choice to save spaces in a kitchen area. 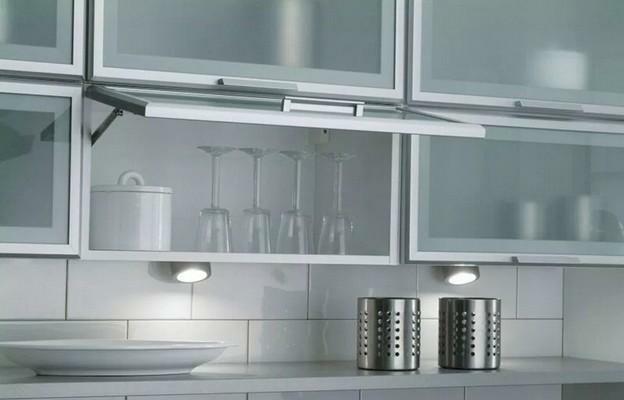 You can have a small wall-mounted glass kitchen cabinet just like the image above. Place it above the sink so that it will be easy for you to save the washed dishes. The dominating wooden kitchen cabinets in this kitchen are adding colors to the area and makes it looks brighter and more attractive. luantranco.comThe glass kitchen cabinets in the picture above are dominated by white, making it looks clean and minimalist. The kitchen cabinets are installed around the stainless steel oven in order to create a pretty blend. The patterned brown marble countertop makes the kitchen area looks less plain since white is dominating the kitchen area. 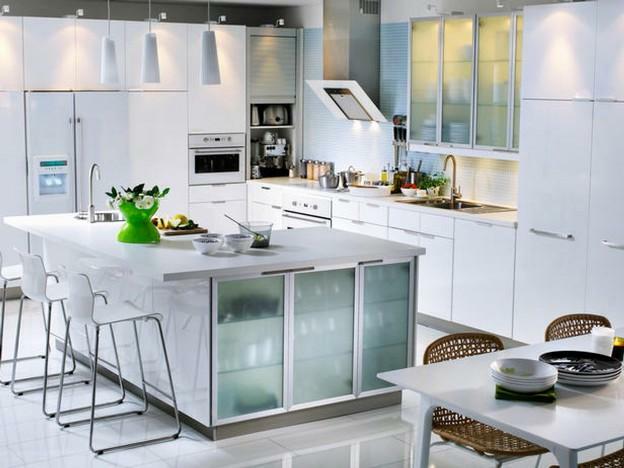 This kind of glass kitchen cabinets is suitable for a modern minimalist kitchen. The glass window reflects the sunlight to the cabinet, making it looks shiny. ocsstream.infoA glass kitchen cabinet is not only able to create an elegant touch, but also other touches such as a futuristic touch. 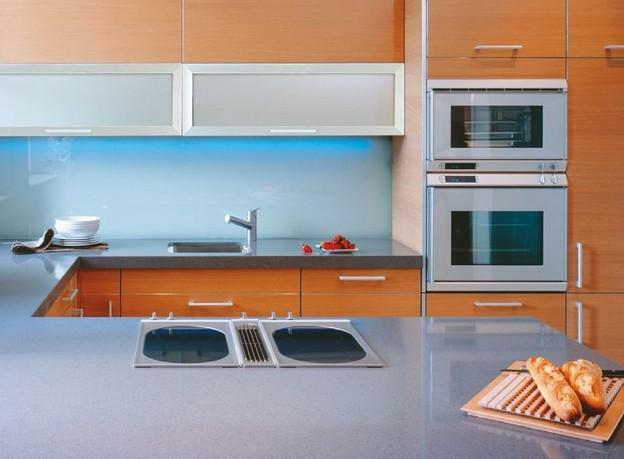 If you want to bring a futuristic look to your kitchen, you can follow this idea of a glass kitchen cabinet. The kitchen cabinet above uses a clear glass material, displaying the collection of tableware that the householders own. The silver stainless steel frame is the element that brings the futuristic style. This type of glass kitchen cabinet is also perfect to be used as a kitchen decoration. www.anadiomenadesigns.comThis kind of glass kitchen cabinet above is suitable for creating a simple minimalist look. The white color used as a dominant color makes the minimalist look even stronger and more accentuated. The white tableware is stored in the white framed kitchen cabinet, accentuating the clean look. In order to add colors and create a monochrome theme, the householders choose a black marble countertop so that the kitchen area looks less plain but the minimalist look is still maintained. veroniquedrougard.comWhite is dominating this kitchen area, making it looks very clean and bright. The wall built-in glass kitchen cabinets blend perfectly with the dominating white. 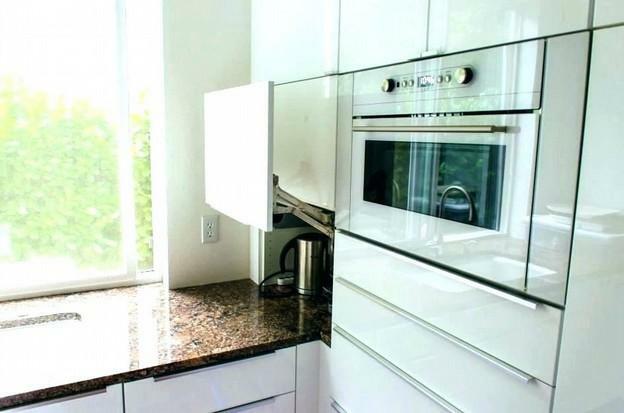 The blurred kitchen cabinets are added at the bottom of the countertop, making it easy for the householders to take out the tableware they need. In order to make the kitchen area looks less boring, the rattan dining chairs are added. Those are the inspirations of a glass kitchen cabinet which are suitable for any style of a kitchen in your house.